Welcome to the five hundred and second of my blog interviews with novelists, poets, short story authors, biographers, agents, publishers and more. 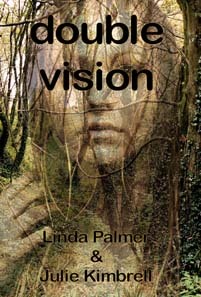 Today’s is with romance, paranormal erotica and young adult author Linda Palmer. A list of interviewees (blogged and scheduled) can be found here. If you like what you read, please do go and investigate further. Morgen: Hello, Linda. Please tell us something about yourself, where you’re based, and how you came to be a writer. Linda: I was born and have almost always lived in Arkansas (did live in Texas a short time). The middle of three girls, I was the one with the big imagination. My sisters have other talents I could never claim. I started writing for pleasure at an early age. Poetry, first. I actually have a letter that my third grade teacher wrote to my parents, telling them she thought I had writing talent. In junior high and high school, I moved on to short stories, usually romance since I’m a hopeless romantic. Yeah, I’ve had crushes on many a mythical man–Robin Hood, in particular–as well as some flesh-and-blood guys such as Roy Rogers. I didn’t write a full-length novel until the late eighties. By then I was married with two children and a government day job, but that didn’t stop me. Looking back, I don’t know how I juggled my careers. Morgen: How lovely that you’ve been writing for so long and clearly with such passion. Having given up my job in March I don’t know how I worked and blogged at the same time… well, I do, 4-5 hour nights, but when it’s something you love… What genre do you generally write and have you considered other genres? Linda: I started as a Silhouette author writing contemporary women’s romances. These were formulaic in that they all had an ensured happy ending, which suited me fine. Over a ten-year period, I wrote 21 novels under my maiden name, Linda Varner. When I burned out on category romance, I took a break and did some reading. I found that I liked two very different genres–paranormal erotica and paranormal young adult. So when I could not write any longer, I restarted my career focusing on them. These days I occasionally write romance that isn’t paranormal, but I prefer stories with witches, werewolves, vampires, ghosts, and psychics. Morgen: I have to say given the choice, I’d be the same. I rarely write romance (although it’s usually not as bad as I think when I start them) but even then I usually manage to kill off someone. 🙂 What have you had published to-date? Do you write under a pseudonym? Linda: To date, most of my Silhouette romances are still available, with some now being offered digitally. 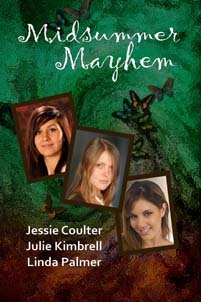 I also have eleven young adult titles available, as well as novellas, short stories, and three anthology contributions. As for my erotica, the pseudonym will remain a secret as far as this interview goes since I don’t want any teens to stumble across my stories. I will say that I have two full-length novels and fifteen novellas out there, all paranormal in one form or another. Morgen: Have you self-published? If so, what led to you going your own way? Linda: I have publishers–Sugar and Spice Press, Wild Horse Press, Uncial Press, Changeling Press and Ravenous Romance Publishing–but I’ve also self-published two books just to get a feel for it. I like self-publishing, but it’s definitely scary not getting an editor’s input. Morgen: Readers just be just as useful. Plus if something is an eBook, you can change it easily. You mentioned your ‘digital romances’, are all your books available as eBooks? Do you read eBooks or is it paper all the way? Linda: All of my recent books are available as eBooks; some are in print. I own a Kindle, and, yes, it’s packed with the books I loved. My most recent acquisition was all seven Harry Potter books. I was thrilled to shelve ten pounds of novels by placing them in a less-than-one-pound e-Reader. Morgen: eBooks do tend to be cheaper (and rightly so), although I have seen some (mainstream) more expensive which makes me pretty mad because the overheads are SO much lower… a topic for another time, I think. Do you have a favourite of your books or characters? If any of your books were made into films, whom would you have as the leading actor/s? Linda: Whatever book I’m writing is usually my current favourite, though I do have a soft spot for certain stories. I love Jaguar Moon because it was my first really, really paranormal novel. I love Operation: Normal because it was the first teen romance I ever sold. 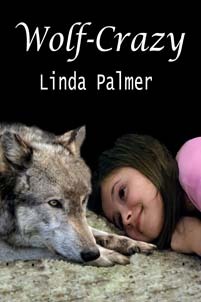 I love Wolf-Crazy because it is my latest release. As for the lead roles if my books were optioned for a movie…hm. That’s hard. Most of the young actresses I admire are really too old to play teenagers–Kristen Stewart, Amanda Seyfried, Keira Knightly. Morgen: Kristen Stewart managed it in Twilight and Amanda looks pretty young. I should say Keira does (especially as she’s the British choice) and I guess it depends upon the movie. Did you have any say in the titles / covers of your books? How important do you think they are? Linda: I’ve always had a say in my titles. As for the covers, I’ve only been allowed input on the e-books. I’ve actually started making my own covers, and I love doing it. Morgen: Oh so do I. There’s a great resource (http://morguefile.com) for free photos (do check the terms and conditions though) although so far for the eBooks I’ve used my own. What are you working on at the moment / next? Linda: I’m playing with an idea at the moment. If it falls into place, it will be about a high school girl who is psychic. Working title: Lifers. I just finished two projects. One is the fourth book in my werewolf series, Wolf of My Heart, published by Wild Horse Press. The title is Wolf-Crazy. The other project was an anthology contribution built around Midsummer’s Eve. It’s called Caught. Morgen: They sound great and you sound prolific. Do you manage to write every day? Do you ever suffer from writer’s block? Linda: There are days when I don’t even turn on my computer, but they’re rare. Writers write. I’ve never suffered from writer’s block. If I’m not in the mood to face the keyboard, I don’t. I realize that’s a luxury. But since writing was my secondary career until two years ago, I understand why some people have to write every day to make a living. Morgen: Writers like to write although sometimes life (and marketing) gets in the way. Do you plot your stories or do you just get an idea and run with it? Linda: For shorter works (10K and under), I run with it. For books (50K and up), I definitely write a synopsis. Otherwise, I waste time writing scenes that go nowhere or don’t forward the story. Morgen: That’s true. I’ve done NaNoWriMo four times and plotted the first and it ran away with me. I soon learned to reign things in when I start to waffle, although 50K in 30 days is all about quantity over quality and the real works starts once NaNo’s over. Do you have a method for creating your characters, their names and what do you think makes them believable? Linda: Yes. I’m constantly on the internet looking up unique names that fit my character. Same for last names. If the name is wrong, the character won’t work. Silly, but true. Morgen: Oh no, it’s absolutely true. I often change my characters names when they don’t fit. Do you do a lot of editing or do you find that as time goes on your writing is more fully-formed? Linda: I’ve never written drafts. When I get finished with a page, I’m done except for cleaning up the typos. But I spend an hour on a page, so I’ve probably put in my time. Morgen: Ouch. Do you have to do much research? Linda: Oh yes. I heart Wikipedia!!! I’ve found that my story usually evolves from the research. For example, if I know I want to write an erotica piece about a, say, a mythological god, I read up on him and invariably the story pops out of that information. Morgen: I love that. 🙂 What point of view do you find most to your liking? Linda: I prefer first person. It puts the reader right in the middle of the action. Morgen: Do you write any poetry, non-fiction or short stories? Linda: I write lots of short stories. I love them. Morgen: Me too. It’s my ‘thing’, and I write one a day (so I get to write every day) for my blog’s 5pm fiction slot. Do you have pieces of work that you think will never see light of day? Linda: A few. Usually I rework parts of them into other stories, so little goes unused. Morgen: Excellent. I like to think that everything I’ve written will find a home (having been severely whipped into shape of course). Have you had any rejections? If so, how do you deal with them? Linda: Most of my rejections have come from agents. I don’t take them personally. No one has to like me. I just try someone / somewhere else. Morgen: I like to think it’s just the right thing for the wrong person. Do you think agents are vital to an author’s success? Linda: No and no. In today’s writing climate, there’s no reason not to do everything yourself. Morgen: As you said earlier, it’s fun. 🙂 Do you enter competitions? Are there any you could recommend? Linda: Yes. I’d recommend the yearly Electronic Publishing Industry Coalition‘s contest. Morgen: Not heard of that, thank you. I shall investigate. How much of the marketing do you do for your published works or indeed for yourself as a ‘brand’? 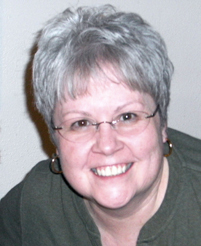 Linda: I do everything I can: guest blog, interviews, Facebook, Twitter, online scavenger hunts (sponsored by eBook sellers), my website, book trailers on YouTube, etc. It’s hard to get your name out there. Morgen: I like the sound of ‘online scavenger hunts’. 🙂 What’s your favourite / least favourite aspect of your writing life? Has anything surprised you? Linda: My favourite part of writing is when a reader gets what I’m trying to do. My least favourite is when there are mistakes in a book that I or my editors should’ve caught. Morgen: It invariably happens to most (or certainly many) books. What advice would you give aspiring writers? Linda: Stick with it. Focus on grammar, punctuation, and word crafting. Those things matter. The best plot in the world is useless if you don’t have the skills to put it to paper. Morgen: Indeed, although I’ve heard (from writers mainly) criticism for Dan Brown’s and JK Rowling’s writing but that they tell good stories. I’m sure you can certainly vouch for JK. 🙂 If you could invite three people from any era to dinner, who would you choose and what would you cook (or hide the takeaway containers)? Linda: I’d like to meet Charlotte Bronte. Jane Eyre is my all-time favourite novel. I’d also like to meet JK Rowling and Lady Mary Stewart. I’d serve them southern fried chicken, mashed potatoes and gravy, green beans, and my mom’s chocolate pie. Morgen: Yum. Is there a word, phrase or quote you like? Linda: “It’s not our abilities that show who we are, it’s our choices.” Dumbledore to Harry Potter, The Chamber of Secrets. Morgen: 🙂 Are you involved in anything else writing-related other than actual writing or marketing of your writing? Linda: I edit other people’s books and theses. I create book covers. I’m also helping a woman self-publish to Kindle. Morgen: It’s not that hard a process. Everything is scary until we have a go. Once it’s done you then have the template to do more. What do you do when you’re not writing? Linda: I’m a licensed cosmetologist! Morgen: Although I was pretty sure what that was, it’s not a term I’ve heard before so Wikipediad it. 🙂 Are there any writing-related websites and / or books that you find useful? Linda: I swear by Techniques of the Selling Writer by Dwight V. Swain. You can find it at Amazon.com. Morgen: Are you on any forums or networking sites? If so, how valuable do you find them? Linda: I am on a few. They can be valuable, but they can also eat up your time. So be choosy. Morgen: They can indeed. I’m on loads but I don’t spend a lot of time on each, I tend to leave them on my connections-type pages so I know if I’m involved in any conversations. What do you think the future holds for a writer? Linda: I think that technology is taking old-fashioned publishers to their knees. I think authors can and should take control by eliminating agents and self-publishing. Morgen: It does tend to be the way writers are going (and I have heard that some agents are becoming small presses) and it no longer has the stigma it once had. Where can we find out about you and your writing? Linda: My website is www.lvpalmer.com. Morgen: Is there anything else you’d like to mention? Linda: I’ve collaborated with my daughter on a couple of books–S’nat Wars and Double Vision. That was a lot of fun, and we have another in the works. Linda: Also, thanks for this opportunity. Morgen: You’re very welcome, Linda, thank you for taking part. Zeke Sterling, the love of Skyler Walker’s life went missing over a year ago, leaving her an emotional mess. Now he’s standing on her front porch with an earring and tats, still unaware that she adores him. If she dares believe his crazy story of abduction, teen gangs and werewolves, will they both be wolf crazy? Linda Varner Palmer has been writing for as long as she can remember. In 1989, she sold her first romance to Silhouette Books, writing as Linda Varner. She wrote twenty more over the next ten years, with all being translated and sold worldwide. She was an RWA Rita finalist in 1993 and 1996. After taking a break, Linda is at her computer again, writing e-books as Linda Palmer. She is focusing on teen romances with a paranormal twist and is thrilled to announce sales to e-publishers Uncial Press, Sugar and Spice Press and Wild Horse Press. Linda’s YA novel THE CINDERELLA SWAP won the Electronic Publishing Industry Coalition’s (EPIC) 2011 award in the YA category. Another YA novel, NIGHTMARE, INTERRUPTED, won the 2012 award. Visit her website: www.lvpalmer.com. As I post an interview a day (amongst other things) I can’t unfortunately review books but I have a list of those who do. I welcome critique for the four new writing groups listed below and / or flash fiction (<1000 words) for Flash Fiction Fridays. For other opportunities see (see Opportunities on this blog). I really love these interviews. Morgen gets more out of the author. You feel like you really know then when she is through. I wonder if most authors start with poetry before they write their novels? I think you need to have a little poet in you. This book sounds very interesting too. Good luck with your book. Thanks, Morgen for a lovely interview. You’re very welcome, my pleasure.